Update: Bull broadcast is set to begin at 5:50 pm. One way to look at WDBB’s late entry into the preview/prognostication arena today is that we were waiting for everyone else to have their say. And there’s a bit of truth to that. On the other hand, the main reason is that we weren’t able to get to the keyboard as early as we would have liked to. That means that we were just late. Let’s see what everyone else has to say. To our surprise, the Raleigh News & Observer has noticed that the Bulls are in the playoffs. However, for some reason they devoted much more ink to an article on all the Tampa Bay Rays who have played in Durham. In Durham, Joe Johnson of the Herald-Sun has a good piece on the playoffs (Even has the time of tonight’s game, 6:05, right, not sure exactly when they will start broadcasting). 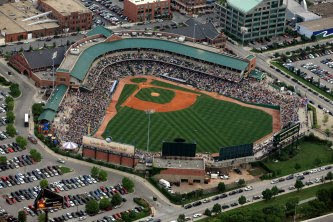 As do all the rest of the write-ups, Johnson notes that the Bulls are once again opening up the playoffs against the Reds franchise the Louisville Bats. Up in Louisville, Courier-Journal writer Michael Grant gets some quotes from Bats Manager Rich Sweet, who does a bit of poor-mouthing. That worries me a bit. Also up in Louisville is this item off the Bats website. The IL’s website has a Governors’ Cup overview that does a nice job of looking at how the series will work and has summaries of the four teams in the playoffs. Jim Donten, at RaysProspects, has put together a very nifty table comparing the two teams. He, along with others, seems to think that Alex Cobb is going to get the call for the third game start the day the Bulls get back to Durham. We’ll see about that. Finally, Adam Sobsey at Triangle Offense does a detailed position-by-position analysis that looks very closely at both teams. The Bulls have adequate starting pitching and, on good days, a terrific bullpen. If the pen doesn’t get stretched too far our overall pitching should be just fine. The fundamental defensive skills of our infield and outfield are superb, especially if Chavez is back. The Bulls have speed in the outfield and good hands in the infield. We haven’t noticed any particular problems with either Nevin Ashley or Craig Albernaz, so we can hope we’re OK behind the plate. While the Bulls certainly don’t have the pop at bat that we were seeing earlier in the season, they can get on base and they can, mostly, run very well. Veteran presence counts for a lot. We mentioned earlier that with a crew like Johnson, Richard, Ruggiano, Perez, Dillon, Chavez we can expect a lot. Lastly, we don’t know, for sure, that Charlie Montoyo is a better, smarter manager than his opponent. But so far it sure looks that way. OK. Predictions out of the way. This last is for those few who may not be quite sure about how to listen/watch the Bulls while they are on the road. Here's my approach. Other techniques welcome. No computer? Turn on the radio and tune to AM 620 (also works if computer connection drops out). On the Bulls website in the upper right hand corner is the “scoreboard” and buttons for “listen live” and “watch live”. I’ve had bad luck with MiLB.com’s TV, but could be my browser/provider combination. So I click on “Listen Live” to get WDNC. After the game starts you can sometimes find a “Gameday” link on the scoreboard as well. I really like Gameday, and I prefer to get that link working early. Here’s a way to chase that down before the game starts. That takes you to the last game the Bulls played on the MiLB site. That takes you to a page with the two games scheduled for tonight. A few minutes prior to the game a small graphic will appear under grid that looks like a baseball diamond. That’s the “gameday” link. Gameday is a graphic representation of the game on a pitch-by-pitch basis. I usually listen to the audio feed while watching gameday. If someone out there does look at MiLB.com TV and has had a good experience, jump in and tell us about it. Game One: Wednesday, Sept. 8; Richard De Los Santos @ Chad Reineke, Louisville Slugger Field, 6:05 p.m.
Game Two: Thursday, Sept. 9; Aneury Rodriguez @ Tom Cochran, Louisville Slugger Field, 6:05 p.m.
Game Three: Friday, Sept. 10; TBA vs. Alex Cobb, Durham Bulls Athletic Park, 7:05 p.m.
Game Four Saturday, Sept. 11 (if necessary): Ben Jukich vs. Bobby Livingston, Durham Bulls Athletic park, 7:05 p.m.
Game Five Sunday, Sept. 12 (if necessary): TBA vs. Paul Phillips, Durham Bulls Athletic Park, 5:05 p.m.
Hmmm. Must have gotten tossed off DeMargel's email list. Thanks, Doug. As to gameday, just go to milb.com and click the link from the main scoreboard on the main page. The "diamond" will appear quite a bit before gameday usually during warmups. Had my first experience with MiLB.tv a few weeks ago and seems to be functioning just fine. It's not a high-quality feed. Works just fine on a Mac and a linux machine, both running Firefox (though I needed to download some plugin on the Mac.) Worth the $7 for a month of games, especially during those last two road trips. Also, I've really enjoyed the blog this season. Thanks for keeping us up-to-date and providing your commentary. Hope to see a couple more weeks' posts before you close up shop this weekend. Chris D: You're approach is simpler than mine. Thanks.